On Saturday December 1st, Mike Green AG4LT, stepped down as the Emergency Coordinator for Polk County ARES, due to personal reasons and time constraints. Green had served as Emergency Coordinator for Polk County ARES since January 1, 2016. Jim Stewart W4XDS, Polk County ARES Assistant Emergency Coordinator for Operations, has been appointed as the new Emergency Coordinator for Polk County ARES effective on Saturday December 1st. 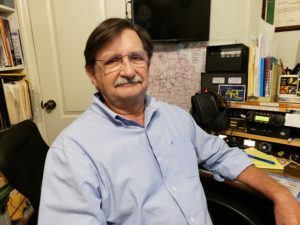 Stewart was first licensed in 2002, but did not really become active until 2011 after joining the Lakeland Amateur Radio Club, then upgrading from Technician to Extra in only a few months. Stewart has since served as a board member of the Lakeland Amateur Radio Club since 2016. In 2012, Stewart joined Polk County ARES, first volunteering to be a net control, then became net manager for the Polk County ARES Net, and finally became Assistant Emergency Coordinator for Operations which Stewart has been for several years. Professionally, Stewart was a Data Systems Technician in the U.S. Navy. Following 8 years in the U.S. Navy, Stewart worked for Publix as a COBOL programmer and finished his career with Publix as an Infrastructure Architect. The ARRL West Central Florida Section extends his sincere thanks to Mike Green AG4LT for his three years of service as Emergency Coordinator of Polk County ARES and welcomes aboard Jim Stewart W4XDS as the new Emergency Coordinator for Polk County ARES.